On August 19 and 20, 100 NSU Shepard Broad College of Law students, staff, and faculty members volunteered at regional public service organizations to mark the end of new law student orientation, celebrate the new academic year, and continue a long-standing commitment to the local community. The community public service event capped off a week of orientation for the 240 new law students. The entering class was five percent larger than the prior year. While most are from the South Florida region, students enrolled from across the U.S. and abroad. Ten percent of the new students are foreign lawyers or part of dual degree programs with foreign law schools. The combination of a global perspective and local service come together to focus the NSU Law’s education on preparing lawyers with the skills, knowledge and technical know-how to succeed in a challenging legal marketplace. 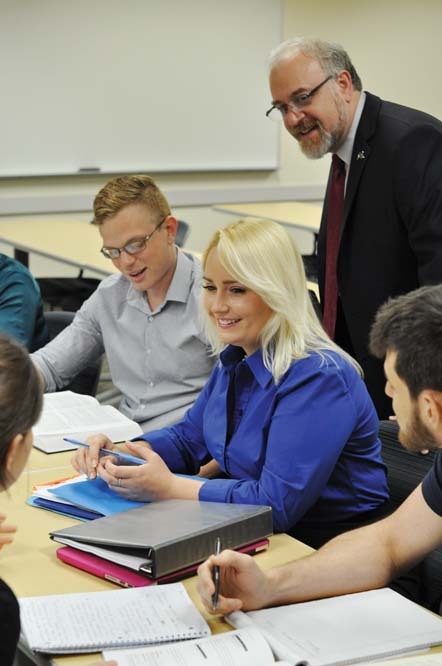 NSU Law’s courses, workshops, and labs focus on practice readiness for its law students. NSU Law was an early pioneer in providing on-campus, live-client legal clinics to benefit the student interns, and the public clients. NSU recently expanded its clinic offices, creating a high-tech legal office to help train its students. The most recent addition to the live-client clinics focuses on Adults with Intellectual and Developmental Disabilities Clinic. This clinic is funded through a generous donation by The Taft Foundation and will begin operations later this semester. It joins a number of other specialty service clinics, including the Family Law Clinic and Veterans Law Clinic which provide full-service legal assistance to eligible clients on a pro bono basis. As part of the growing clinical education, in February 2016, NSU Law launched a clinical legal incubator program. The legal incubator provides post-graduate training for new lawyers, enabling recent graduates to hone their practice skills and launch their own law offices. Attorneys in the program commit to donating a minimum of 200 hours of pro bono legal service in exchange for the support and training in the development of their business. The faculty also provide over forty workshops and lab courses so students receive high-quality training in the skills they will practice as lawyers. In addition, a robust student-alumni mentoring program and monthly continuing legal education programs focused on important legal topics keep alumni connected to the law school community. For most students, however, live-client legal education is done in the field. Volunteer attorneys in government agencies, private offices, and other settings supervise law students who learn the legal skills and professional strategies to transition quickly from law student to lawyer upon graduation. Through the clinics and field placement programs, NSU Law guarantees a live-client clinic or field placement to every student. Since opening its doors in 1974, NSU Shepard Broad College of Law has also focused on preparing graduates to practice within the international environment that defines South Florida. The international flavor has continued to grow in recent years. That approach has led to a highly diverse student body, including students from across the globe. In the past year, NSU Law has helped found a new, international consortium which has quickly grown to 24 universities across five continents, hosting the consortium’s inaugural teaching conference. NSU Law students are able to earn dual degrees in Rome, Barcelona, or Prague, enabling the participants to practice in both Europe and the United States. In other key areas, NSU Law has been part of the transformative changes to legal education. Health law has become an important program, and NSU has greatly expanded its courses and partnerships. In May 2016, NSU added a dual degree program between law and public health. This new degree program is in addition to programs with medicine, computer science, business, tax, and many other fields. The law school’s dual degree programs enable the Shepard Broad College of Law to take full advantage of the broader growth within NSU, which has been ranked 214 among the top national universities by U.S. News and World Report for 2017. Further building on the innovation and entrepreneurial spirit of the university as a whole, the law school has developed a comprehensive series of course offerings focusing on the “business of lawyering.” These offerings bring financial literacy, management, leadership, and other core business skills into the law school classroom to help assure that NSU Law graduates learn how to be business leaders in their community in addition to being great lawyers for their clients. Although the marketplace for lawyers remains challenging, the focus of NSU Law on graduating experienced lawyers who are committed to South Florida’s global community remains as strong as when NSU first launched its law school. Through courses, partnerships, workshops, and live-client experiences, today’s NSU Law graduates are better prepared to face the complex legal and economic environment than ever before.